Reborn on the Playstation 3, Time Crisis 4 includes a full FPS game mode, stunning HD quality graphics, a newly designed Guncon to enhance every aspect of the game and an intense new storyline.The U.S. Army's Internal Surveillance Group (ISG) has learned that a top-secret weapon developed by the armed forces is about to fall into the hands of the European terrorist organization known as W.O.L.F. In response, the ISG instructs Captain William Rush to head to California and investigate the incident. Arriving at Pier 5, the enemy's purported hideout, Captain Rush finds himself face to face with unimaginable enemy forces and menacing biological weapons. Meanwhile, having received similar information, the European Union dispatches Giorgio Bruno and Evan Bernard, two agents from the V.S.S.E. International Intelligence Agency. Upon their arrival in California, however, the pair is ambushed by a mysterious military force? Test your sharp shooting skills and complete your objective within seconds, or go head-to-head with a friend in a variety of challenging mini games. In addition to your standard weapons assortment, such as handguns and shotguns, upgrade to grenade launchers and mounted machine guns (FPS mode only) to increase your lethal arsenal. Also features unlockable console exclusive bonus weapons. Turn your living room into a state of the art arcade arena! Join operatives Giorgio and Evan to investigate and prevent a top secret weapon from falling into the hands of international terrorists. The latest and most advanced title in the popular Time Crisis series is now arriving on the PS3. Time Crisis delivers the first and only arcade style interactive FPS gaming experience on the next gen console with HD quality graphics. Superior to its Arcade counterpart, Time Crisis 4 is reborn with additional new free roaming FPS stages along with a new and improved Guncon. In addition to future downloadable content, Time Crisis 4 brings a fresh new look that will carry the series into the next generation. New Guncon - The new Guncon is compatible with all TVs and has been enhanced with 2 analog sticks that will allow you to move freely in FPS mode. Free Roaming FPS &#8211; Exclusive to the console, you are able to roam freely in FPS style through various stages. Change your camera angle, move while crouching, standing and more! Multiple modes &#8211; Along with Story and Arcade mode, destroy biological weapons in Crisis Mission mode, test your sharp shooting skills or go head to head with your friend in various mini games. Downloadable content &#8211; Extend your gameplay by downloading additional Crisis Missions. This game is the most accurate arcade game you can find. It is very fun and easy to use. Great replay value. Compare to ghost squad or Resident Evil it is far more fun. Wiimote is nothing more than mouse, you have to track it on screen to get head shots. Once you calibrate the gun it is pin point accurate. Nothing comes close. This game was actually one of the things that tipped the scale and made me purchase a PS3 (I already own an Xbox 360). I wish I could say it plays better than it does. Graphically, it does not push the PS3. In terms of gameplay, if you have played this game at an arcade, you know what to expect--it's pretty straightforward as to what this game is. I am extremely disappointed in two things. First, the Complete Mission mode has to be played with both hands as you try to move and shoot using the little toggle knobs on the gun controller. That is just plain awful. To say this part of the game is painful to play would be an understatement. And why the gun is not wireless I can't understand. In Arcade mode, there are areas where pointing the gun to the left or the right of the screen is supposed to make you turn to fire at oncoming bad guys. Out of seven or eight sessions, I have only gotten that feature to work once. Awful. The best thing I can say about the game is the third mode, called Extra if memory serves (and it may not). This is just a plain old aim and shoot area where you have to shoot targets of various colors and arrangements. To be honest, this is the only reason I haven't Ebayed the game yet--that and the fact that I am waiting on someone to post a saved game with a "hidden" part of the Extra mode unlocked. There isn't too much that needs to be said about this game other than if you liked Time Crisis 4 in the arcades, you'll probably enjoy this home conversion. If you're expecting lots of neat extras, however, like with the PS2 Time Crisis releases, then you'll probably end up a little disappointed. The new Complete Mission mode that features FPS stages interspersed with the arcade game stages is largely tedious and forgettable. It took me over 40 minutes just to trudge through the first stage, for example, which doesn't mesh well at all with the fast paced action of the arcade game. Ok, so the original $90 tag is ridiculous, but now Amazon's basically offering the game and a free gun. And the gun works great for me, especially when the 5-point calibration method is used (as another reviewer suggested). The arcade mode is fast and fun, even if the story's over-the-top, but who cares about that with this kind of game anyway? The arcade mode is hard, even for those really accurate with the gun (I'm not yet, but with practice it's getting better), but when you get game overs the number of continues increases so it's all good. The mini-games are also challenging, but make for great party game competition. Only reason I dock a star is the FPS mode should have been really cool, but it's not. With all the FPS's being released for the PS3, here's hoping something like Resistance 2 or Call of Duty 5 will take advantage of the GunCon 3 and make good use of the gun in a better FPS game. This game had great potential to becoming one of the funnest game for the PS3 system. The graphics are okay and the Guncon is accurate if you know how to calibrate it right. Now, let's talk about the gameplay, and here is where the developers screwed up (hope there is a patch that can fix this nuance someday). Let me explain, first TC has always be a gun on rails arcade game and they should've left it like that. The FPS mode is cumbersome, the controls feel clunky. Not a lot of fun for me. Time Crisis has never been known for its deep gameplay and complex strategies, but it's still a darn fun series and TC4 is the best one so far. Time Crisis is basically a target game built around a lightgun, which was/is its major draw at the arcades. The name comes from the limited amount of time you're given to complete each stage; usually you feel like you're running behind the clock. Sure, you're shooting "people," but there's no blood, dead bodies, exploding body parts, or other gratuitous violence found in many other FPSes. Honestly, I'm thankful for this. Graphically it looks great, as can be expected of most PS3 games. The classic arcade version runs "on rails"--your character is moved from position to position by the game, all you do is point, shoot, and RELOAD! (The announcer always screams "reload" for some reason.) TC4 adds the ability to look left and right in some scenes, a gun flashlight, and some interesting new opponents, but otherwise is pretty much the same formula as the earlier games--make it through each chapter without getting shot too many times and fight the boss at the end. TC4 includes an FPS mode where you can move around using the Guncon's builtin joystick, but I found this frustrating and not nearly as fun as the classic arcade version. TC4's Guncon is based on the "LED marker" technology used by the Wii and several other new controllers. Older Guncons used a video-sensing lightgun, but that method doesn't work with LCD/LED/plasma/projection TVs. The new design works with any TV, but I've found it is harder to calibrate and it really doesn't feel as accurate as the previous Guncons. I've been waiting for the next installment of Time Crisis 4 to hit the PS3 for a few months now and sad to say I'm a little disappointed. There are both positive and negative things I can say about this game. I will start with the good news. The calibration in this game is pretty accurate and the response is fast. The sensor works a lot better than the Wii's sensor bar so it beats the Wii Zapper. The mini games are pretty short and fun. You can play two players and hit the targets as they appear -similar to Duck Hunt. Compete to get the most amount of targets. 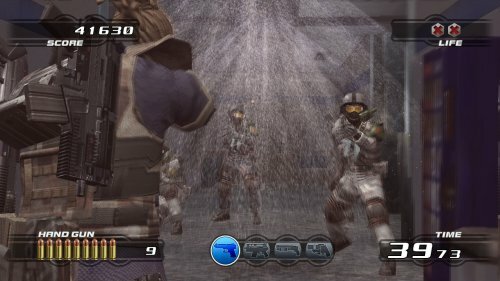 The FPS (first person shooter) mode is something entirely different for the Time Crisis franchise and I'm happy to say they did a good job on it. You get to move around and shoot just like any FPS game. In addition to your new set of movements, you also get to use different weapons (i.e. shotguns, machine guns, knives, etc). Your health bar can also revive itself you you're idle long enough. I am glad they added this new feature to the game it makes the game a lot better. Decent FPS but don't expect it to be anything like Resistance: Fall Of Man or Call of Duty 4: Modern Warfare. A good rail shooter for the PS3. Time Crisis 4 is a decent rail shooter for the PS3. Nice graphics and decent game play. The game comes with 1 guncon 3, the game, and a pair of sensor devices enabling a light gun to be used on plasma or lcd television. The graphic of the game are decent. It look like the arcade, but there are times where in certain area, the game slows down from 60 frames to 30 frames, it does not effect the game. The gameplay is like the other Time Crisis game, you shoot and reload. There is also a mini game mode where to do target pratice, as well the new FPS mode, not only you shoot the enemies, but have to move like in any FPS game. The mode tends to get confusing because there are many things the player have to do, there is a button to reload, a button to duck, etc.... and also since it is a rail shooter at the same time, you have to point at the enemy to shoot, there is no target in the middle. Overall of this mode is a good concept, but gameplay wise gets confusing. I give the game a 4, and the gun and sensors a 2.
ok so the game it self is decent. i beat the first couples and liked what i saw. i used to play time crisis in the arcade, and this is one of my favorites all time. i had the previous 2 time crisis games and they were very good not that strong in the story line but you dont buy this game for a story line you use it to shoot a light gun at your tv. so the main good point is this is a fun game. BUT... and i mean a big but is while the game play is good the execution is terrible.it now comes with the gun con 3 with a joystick. really??? there is no need for a joystick on the gun. this ulitmately means your hand is going to cramp in 5 minutes. you just move from point to point after clearing a wave (classic gameplay=no need to change). the next downfall is the sensors. and this was the main reason i traded this game. i have a 52" LCD HDTV and now they give you these sensor blocks. i'll get to what they do in a minute. but the cables for the blocks is too short so when i put the blocks on top of my tvthey hange over and are in the middle not in the corners like they supposed to be and i cant put them on the dootom because again they don't reach far enough. so the blocks are there so you can hold up a sheild or turn a certain way but turning is not as intuitive as you think it should be. I have a complex job, that is very challenging. What I want in a video game is the simplicity that my life otherwise lacks, and this game provides it. I don't want extremely deep learning curves and "open exploration", that is what real life is for! (I mean, heck, there're a real city right outside my door that features a huge map for me to explore at leisure, and litterally millions of NPC characters that are real people with whom I can have actual conversations.) For me a game should be tight and full of tense adrenaline, structured, fast, simple, fun. Works very well with my 92 inch front projector - I just had to tilt the sensors down a little. I even very, very much like the fps sections reviewers have been complaining about - it feels like you're really there, shooting at dangerous people, much more than other fps titles which do not include "real" gunplay. The Guncon 3 is very comfortable, and very easy to get used to. Extremely addictive, extremely fun, and, with the fps sections, very, very long, although individual sessions can be a few minutes each (between save points) which also suits me well as I do not have a lot of free time in large chunks. I put it on very hard difficulty, and I figure it will take me 6 months to get through it. One of my favorite games ever, along with Motorstorm and Ridge Racer, which also provide simple, arcade fun. Arcade mode is very fun for a while, and this is currently the only light gun game that works with flatscreens. However, the overall implementation is pathetically shoddy. The guncon3 does not work on my 46" tv, only on a 27" one. The calibration is only accurate if you don't move, and the LED lights you have to put on your tv are an annoyance. The gun itself feels cheap and is awkward for me to use in FPS mode because I am left handed. Speaking of FPS mode, this "feature" is so badly implemented as to make it unplayable. AI, graphics (especially in FPS mode), story, and voice acting are insultingly bad. 2-player is a necessity, but there is no way to buy a second guncon at this point, another major disappointment. Other letdowns: no online, no wireless guncon, long loading times in menus, no compatibility with large screens, no compatibility with other games. Hell, the PS3 even calls the guncon an "unrecognized USB device" outside of the game. However, if you get past all this, and get the guncon to work, arcade mode is very fun (while it lasts) and makes for a great party game. Multi-screen battles in arcade mode are also fun, if you realize that the joysticks can be used to switch screens, which is not mentioned in the game or manual at all. This game is a port of an arcade game. One of the features is the included light gun that requires a ugly tangled mess of wires and a sensor array that you have to hang on top of your television. It takes about 5 minutes of setup to play this game if you don't like ugly crap hanging off your HDTV. The light gun and the sensor bar each also take up a usb port on your ps3. Now once you get this mess of a device set up you can begin playing the game. The Guncon has an number of analog sticks and buttons on it for switching to the different weapons, and a button for reloading and hiding. I found holding the second handle to be uncomfortable for long periods, and you left handed shooters are out of luck. This is a bad un-ambidextrous design for the gun. The game itself is pretty fun, but just simply mucks up the fun with having one button to switch between the different guns you may carry. I really like Time Crisis 1 and 2 much better due to the simplicity of weapons and not having to deal with an uncomfortable posture holding this gun. There is also a side game that uses the analog sticks to move around like halo, but I found the level design really un inspired. The control scheme sounds great on paper, but do to having to aim with the unergonomic design of the light gun, playing in this mode got tiring after a while and actually hurt my wrist, back and shoulder.